The volume of incoming mail in companies often reaches an order of magnitude that conventional software can no longer handle – or that can only be managed by investing a lot of man-hours and money. enaio®’s inbox and mail distribution solution meets all legal requirements, and it significantly accelerates and optimizes your mail distribution. Digitized inbox & distribution processes are simply faster. Digitized mail cannot get lost and is quickly retrieved in the ECM system. Digitized mail saves up to 70 percent of the cost of manual processing. Incoming mail is rapidly captured in a fully automated manner, even when handling large volumes. Validation in the course of processing incoming mail ensures the validity and plausibility of data. enaio® provides you with the appropriate modules for this. enaio® offers automated inbox solutions for your company, no matter where the data comes from, e.g., document scans, faxes, e-mail inboxes, as well as COLD or data imports. Letters are digitized using batch scans and classification components. Then the content is captured and automatically stored in the correct context. 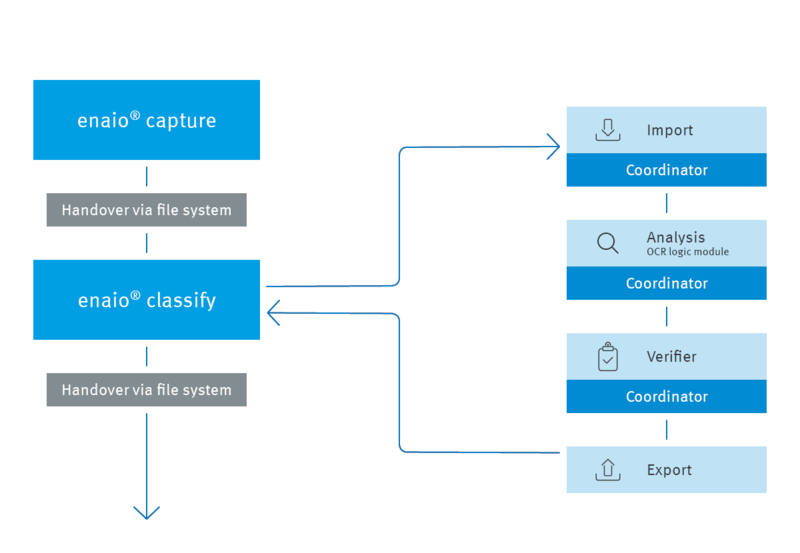 Relevant data is recognized, extracted, and imported into enaio®. This is where the actual distribution to the agents or departments takes place. The data is subjected to validity checks and compared against existing data, e.g., information managed in CRM systems. 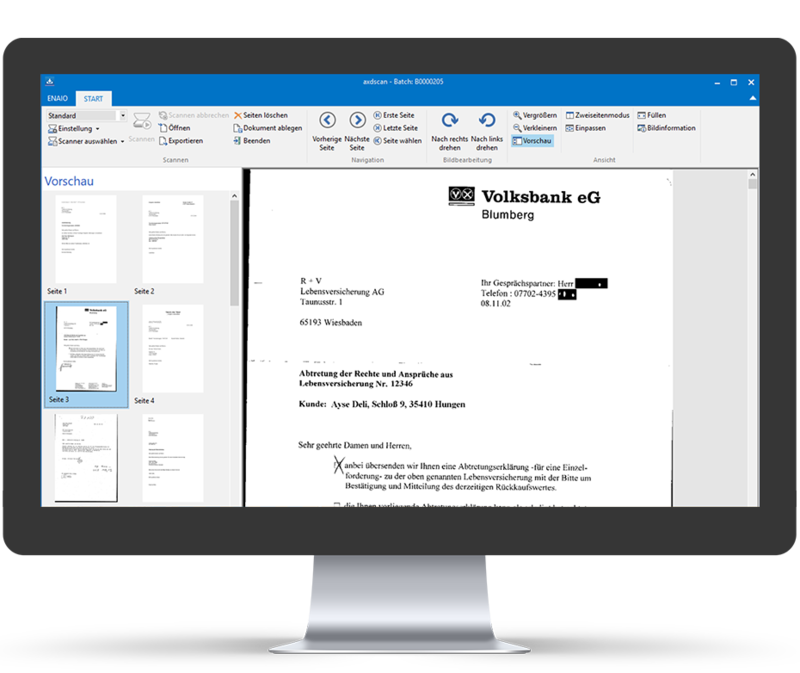 Depending on their content, the documents can trigger different workflows in enaio® that automatically forward the documents to the responsible agents. Substitution rules, follow-ups, and dunning periods ensure that everything is processed on time. The accounting staff now knows at all times which invoices have reached the company and which of these still need to be processed. 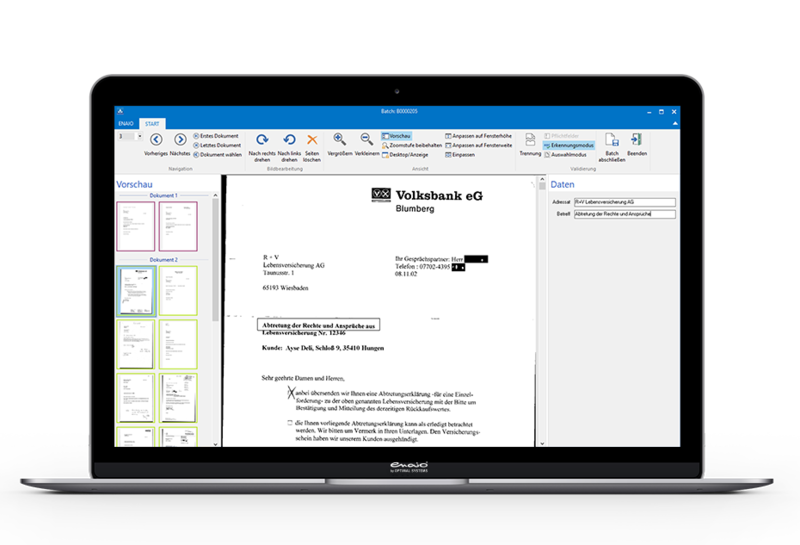 Thanks to centralized incoming mail and invoice handling, we were able to streamline our processes. Now, incoming mail is placed directly in the correct case record without any intermediate steps and is simultaneously displayed in the digital inbox of the responsible employee.